Admiración y respeto mutuo, además de una gran amistad es la que existe entre el músico peruano Gabriel Alegría y el Ganador del Grammy Arturo O’Farrill. Esta se demostró el año pasado, cuando O’Farrill participó en el Festival de Jazz de Lima y se vuelve a demostrar ahora a raíz del próximo disco que el pianista hijo del legendario músico cubano Chico O’Farrill sacará al mercado el próximo 8 de febrero. En este disco, Arturo incluye la composición de Alegría titulada “El Sur”, arreglada por Michael Collins y donde además intervienes como invitados los peruanos Yuri Juárez (guitarra) y Freddy “Huevito” Lobatón (cajón, cajita y quijada), este último haciendo incluso un solo. Esta nueva producción se titula 40 Acres and a Burro, una referencia histórica a la práctica que se realizaba durante la Guerra Civil en los Estados Unidos hace siglo y medio de proveer alguna propiedad a los esclavos negros liberados. También se puede entender como una referencia irónica a la separación de la Afro Latin Jazz Orchestra de O’Farrill del Lincoln Center. 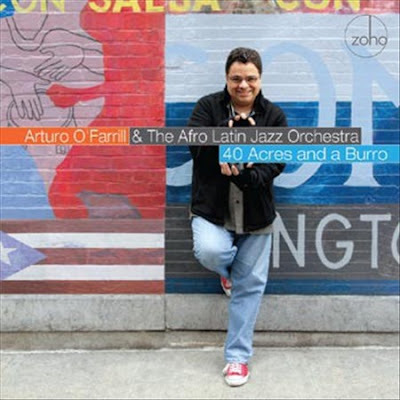 On “40 Acres and a Burro”, 2009 GRAMMY winner Arturo O’Farrill presents his New York based Afro Latin Jazz Orchestra (ALJO) in two exciting O’Farrill originals, and nine stand-out tracks covering the entire Caribbean and South American universe, defining contemporary Latin Big Band Jazz in the 21st century. Principal guest artist : the legendary clarinetist and nine-time GRAMMY winner Paquito D’Rivera! The internationally renowned New York-based pianist, composer, arranger, and band leader Arturo O’Farrill has been at the vanguard of forward-thinking Latin Jazz for several decades. Since its founding in 2003, Arturo O’Farrill’s ALJO has become the world’s leading latin jazz big band, with a vast repertory from the genre’s Afro-Cuban classics to dozens of new works especially commissioned by the ALJO, and premiered on their CD recordings. Achieving a GRAMMY nomination for its first (non-ZOHO) release in 2006, the ALJO won the GRAMMY in the Latin Jazz category for his ZOHO big band release “Song for Chico” (ZMR 200804) in 2009. CD title and closing track “40 Acres and a Burro” (= Mule)is a historic allusion to the Civil War practice of providing farmland to Black slaves who became free men after Union armies occupied areas of the Confederacy in 1865. It can be understood as an ironic reference to the ALJO’s separation from its founding organization at New York’s Lincoln Center and its subsequent re-birth as an independent not-for-profit corporation with annual residencies at “Symphony Space”, on the Upper West Side of Manhattan. Anticipated significant retail demand, as Arturo O’Farrill and the ALJO have continuous live performing presences in New York and around the U.S.